Wow, haven't followed up that much since the MIT SenseAble City Lab and BAN GPS tracking project was pulled to MIT legal office about a year ago. Readers are aware that this blog tracked many of the devices into places that BAN didn't want to talk about - like a University reuse operation in Faisalabad, or modern 21st century EcoPark in Hong Kong (no longer obscured in Monitour). Well I just ran across a little video produced in 2017 by Luen Hai - Decoding the Connection. In it, at about minute 6, a Hong Kong reporter identifies Jim Puckett of Basel Action Network as an important expert in e-waste imports to Hong Kong. Then Jim says on screen that 54% of the GPS trackers the organization placed in e-waste was shipped to Hong Kong. If you know about this study, you may think I made a typo. The numbers are so specifically wrong. But this is Jim's recorded voice, in his own words... screenshots with subtitles below. 1. "These little trackers, and I can show you one, they are like little lie detectors"
IRONY of IRONIES... Listen to what Jim tells the filmmaker about the GPS "lie detector"... Full video at bottom below. Europe (and INTERPOL) Focus Still Explained by "Strategic Metals"? INTERPOL announced 30 days of "recycling crime" enforcement this week. On this I will give them points - They are targeting automobile "recycling crime" and waste exports, and not as many of the photos seem to show reuse or Tech Sector imports. I believe Fair Trade Recycling (WR3A) has been effective in reducing the enforcement agency's obsession with "e-waste exports". The photo of lead-zinc ore for sale from Africa's most toxic mine (Kabwe in Zambia) is apparently legal. There's no law targeting the most toxic activity on the planet, because it isn't "waste"... so there is no fetish attached to it. I love INTERPOL's focus on tigers and elephants and shark fins and ocean dumping. I'm enthusiastic about illegal forestry and charcoal trade. But what explains INTERPOL's strange obsession with recycling, when MINING is so much worse for Africans and the planet? 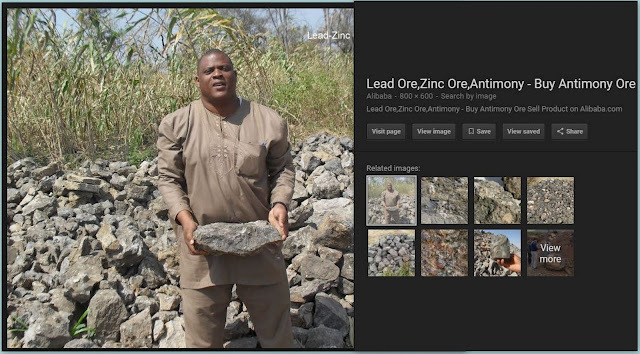 Mining lead-zinc ore from Africa's forests, for sale to Asia and Europe, is legal. But it is apparently not legal for Africans to buy back scrap metal? Have only seen the E-Life Youtube trailer so far. Ed Scott-Clarke did respond to my email and suggested I wait to see the documentary. So... this is only a review of the trailer. A teaser of the teaser (I'll review the whole doc when I see it). So far, same old same old. A 40 year old TV plastic housing is used as a frame to film men ("boys") burning wire on that spot on the lagoon shore. Supposedly, 40 year old TVs and VCRs are being dumped on primitive tribesmen on the shores of Ghana. Executive Directors Lars Wogen, John Ditchfield, and James Scott-Clarke (relation?) had access to both sides of the story. The trailer shows one side. I can hold my breath, but the fact that they use the exact same "50 year old kitchen CRT TV plastic" in a smoky Agbogbloshie frame for their title shot makes me pessimistic. The 2006 picture of white computers shows a Tech Sector importer in his shop in Dakar, Senegal. The Pentium 3s and 4s were likely 5 years old. They'd be 15 now. The picture itself is 11 years old. Someday, the computers will be Senegal's e-waste, if not already. Until then, they brought the internet to people who could not afford to buy new. And Souleymane, the geek in the white shirt, was one of the most interesting people I've met in a decade. He stayed at my house. We cooked and broke bread together. I accepted his money, and he accepted those computers from Vermont. Most of us don't have a personal connection with Africans in photos of exported e-waste. And most of the photos in the mainstream press do not have any specifics... names, age, date of import, chain of possession, etc. Contrast the 2006 import shop with the 2016 photo. Unfortunately, neither photo is typical in news reports on exports of used electronics to Africa. What do the photos below say to you as an Electronics Recycler? It depends at what Stage of the Recycling Export Experience you have achieved. To end racism and environmental injustice, you must first remember a lesson from childhood. Let your eyes adjust to the dark, and it won't frighten you as much as it does at first. Here are the 9 Stages of Export Denial and Acceptance. The 'Burning Environmental Issue' is Automobile Waste, not e-waste. Clean up Africa's car pollution, worry about electronics later (when you understand it). Hey, Listen..."Sending European used cell phones" to Africa is not the problem, and arresting African export-import traders won't clean the water or bring back "Eden". For two years, I've been making the point that Agbogbloshie is not the largest e-waste dump in the world, and that geeks of color are being racially profiled and arrested. Those things are true. But Accra is polluted, and the grants to date are misspent and misdirected. Before Germany spends $15M - 25M on an e-waste recycling solution, they should look at the photos in the link more carefully. It's a tire, and a ball of automobile wire, not a cell phone. There is a serious pollution problem in Accra and other African cities. Its cause should be obvious as you wend your way from Accra's Kotoka International Airport to the hotel, the day before you spend another hour wending your way to Agbogbloshie's slum... or stuck bumper-to-bumber in Accra (or Lagos, or Nairobi) traffic. The path of least resistance is to trust our environmental regulators, trust the watchdogs, and assume that profit-driven industry is the villain, the fox in the henhouse. The path of least resistance is to assume that people questioning environmental enforcement are "apologists" who care less about environmental pollution than the enforcement proponents. Sometimes those assumptions are 100% right. I'm not a carbon climate causality denier, and I'm proud of my 9 years of service as a Massachusetts recycling regulator. But as a former regulator, I can attest regulators are not always right. Regulatory agency lawyers tend to be more risk-averse than private sector attorneys, for example. Regulators understandably want to hold themselves to "the highest environmental standard". But when there is doubt and uncertainty - an engineering problem for example - the regulator can become obfuscated and defend his own reputation. That is to say, when in doubt, the regulator has to act - in doubt. And saying "yes" or "no" sometimes boils down to the regulator's own insecurities. Let me again state that what the agencies do, for the most part, is great. I'm suggesting an environmental police chief should look at community concerns the way any police chief looks at protest. You can stonewall and deny mistakes, claim 100% effectiveness in your policy. Or you can learn from a mistake and adjust your policy. Musk and Gates are correct in their warnings. AI - Artificial Intelligence - will eventually have the means to use facial recognition software, etc., etc. For starters we have to define "original intelligence".